Only two more weeks to go... I can't believe that I will be jumping the "pond" so soon. The update on my funds came today and I'm at 50% of the total funds needed. Thank you again to everyone that has contributed so far. Here is a quick update on the events of the past few weeks. 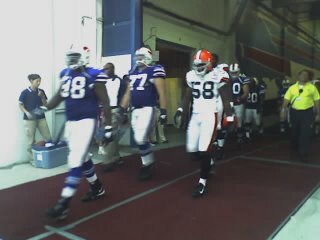 I was in Buffalo last weekend and attended the Bills vs Browns game. 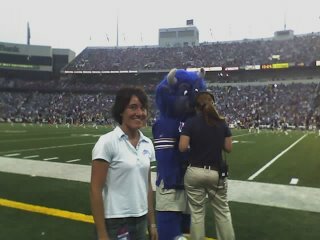 Turkey Hill was sponsoring a competition between two families during halftime, so I got to go down on the field and watch part of the game and then onto the field for halftime. Definitely an experience I won't forget. This weekend I'm back in Buffalo for a Wing Fest. Then I'm heading to NYC for a Jets event with some former players. I will be running around the city for 4 days. I'm always up for an excuse to be in the city. I'll try to get some pictures with the former Jets players for any of the fans out there. I definitely have had some unique experiences lately. Keep checking back for more updates and hopefully some crazy stories.